A boutique Mikomori, a product designer by Japanese popular stylists, opened at the Royal Hawaiian Luxury Collection Resort. An adult resort wear brand “Mikomori” designed by Japanese popular stylist Anzai Kozue opened in Waikiki’s Premier · Shopping attractions, Collections of Waikiki’s Royal Hawaiian Luxury Collection Resort. Kozue Anzai who is a designer of Mikomori is a fashion stylist who is widely active in Japanese famous fashion magazines and advertisements. It is known for many fans in the industry. Mikomori started using Jessica Michibata as an image visual for the brand in 2016 and started selling it at the online store. Mikomori was based on the concept of “adult resort wear that can fully enjoy the resort’s journey.” Resorts wear and bathing suits based on monotone are both chic & basic which can relax, somewhere fashionable, feminine. Wearable not only in the resort but also in the town, it features an excellent design. That Mikomori selected as the location of the first flagship store in Japan and abroad is inside the Royal Hawaiian Luxury Collection Resort in Waikiki called “The Pacific Palace in the Pacific”. 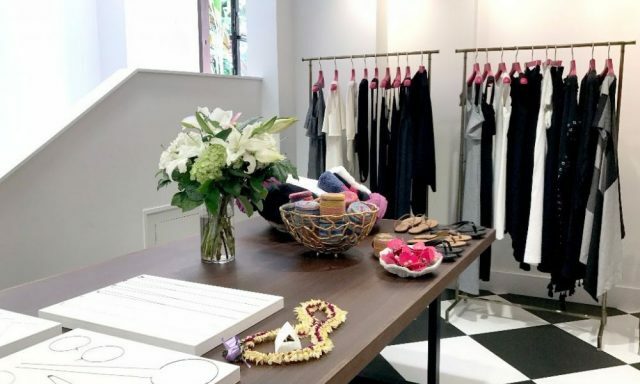 Inside the store, we also sell Hawaii limited jewelry which collaborated with the brand “Enasoluna” of fashion model Mayada Maya, as well as jewelry, home merchandise, including swimsuits and dresses that are original designs of Anzai. Among fashion-sensitive Hawaiian favorite models and actresses, SNS’s influencers, among other high-profile brands that have become popular already.